February 26th—Zionsville, Indiana. 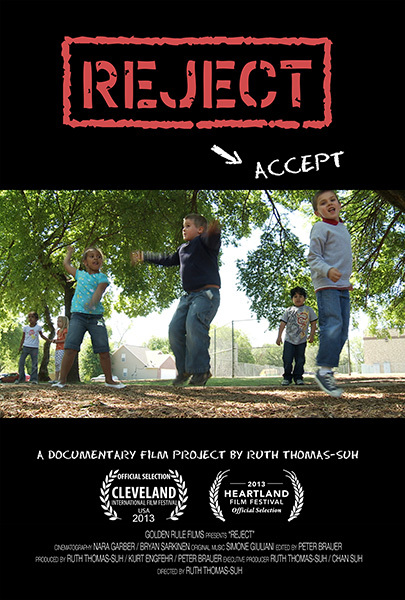 Zionsville Community Schools present Reject documentary community screening with Purdue University Distinguished Professor of Psychology Kipling Williams, guest speaker. March 7th—Fayetteville, Arkansas. University of Arkansas, Arkansas Union Theater 6pm-8pm screening with featured guests and panel discussion. With Amanda W. Harrist Distinguished Professor of Human Development Oklahoma State University, guest speaker. Sponsored by School of Human Environmental Sciences. June date tbd—Tulsa, Oklahoma at OSU Center for Health Sciences. 5th Annual Reject “Fit to Learn” conference. 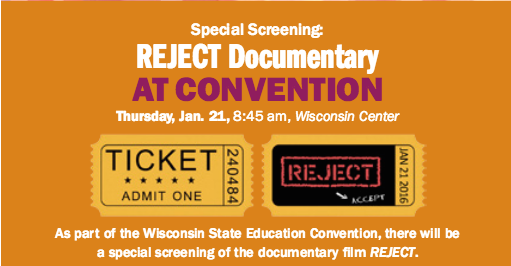 Reject documentary screening and presentation with experts from the film—Amanda Harrist and teacher Terry Varnell. January 24th—Harrison County, Indiana. Purdue University Harrison County hosts REJECT documentary community screening and discussion. Purdue University Distinguished Professor of Psychology guest speaker. March 3rd—REJECT experts Terry Varnell and Amanda Harrist present on the inclusive early childhood classroom at the annual New Jersey state Montessori Conference. April 30th—Kittery Maine. Kittery Youth Committee screenings REJECT. 6-7:30PM at Kittery Community Center. 120 Rogers Road Kittery, Maine. January 23rd— Tomah, Wisconsin. Tomah School District Screening for all Professional Staff at HoChunk Cinema, Private Showing. February 7th— Ithaca, New York. “How Can We Make Our Schools More Inclusive?” Family and Children’s Service of Ithaca, Tompkins County Public Library, BOCES and Ithaca School District sponsor REJECT screening and workshop professional event from 8:30AM-4PM. 6CEU credits. Register through mylearningplan.com or call Linda Bryan at 607-273-7494. March 15th— Brighton, England. University of Brighton, School of Applied Sciences. April 3rd— Ithaca, New York. “How Can We Make Our Schools More Inclusive?” TST BOCES presents this professional workshop “back by demand” event led by Ithaca City School District social worker Celia Clement from 8:30AM-4PM. May 19th —Cleveland, Ohio. Rejection, Ostracism, and Social Exclusion: Causes and Consequences at MetroHealth Medical Center. Two-day conference May 18-19, registration required. Conference recommended for social workers, nurses, marriage and family therapists, psychologists, counselors, funeral directors, clergy, physicians and teachers. June 6th —Tulsa, Oklahoma. The 4th annual “Fit 2 Learn” Summit at Oklahoma State University Center for Health Sciences. This FREE event, organized by “Tulsa Healthy Living Program”, is for classroom and physical education teachers, child nutrition personnel, child health advocates, and anyone interested in creating healthier school environments. Registration required HERE. June 13th —Indianapolis, Indiana. 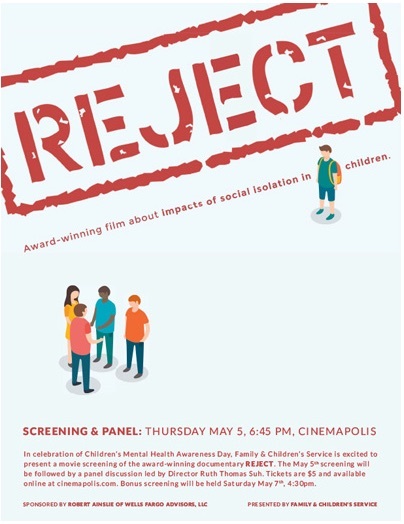 “Dealing with Rejection and Ostracism” REJECT documentary screening and panel discussion with co-hosts non-profit Child Care Answers and Purdue University Extension Bartholomew County Health and Human Sciences. This is a FREE event! Registration required HERE. January 21st— Milwaukee, Wisconsin — 95th Wisconsin State Education Convention for Superintendents and School Leadership. Registration information —> 2016 Joint State Education Convention. Film Screening: Session 8:45AM-10:30AM. Follow Up Session 10:45AM: Social Ostracism with Dr. Kip Williams, Professor of Psychological Sciences, Purdue University. This event made possible with with the support of Performance Services Inc.
Week of June 6th— Ithaca, New York. Private Screening Series, Ithaca High School. August 24th — Tulsa, Oklahoma. The Oklahoma State University Center for Health Sciences. Co-hosted by the Medical School and OSU Center for Family Resilience. August 30th —La Crosse, Wisconsin. Rebuilding for Learning Summit VI—”Continuing Our Journey as a Compassionate and Responsive Community.” Director and ostracism/social rejection expert Kipling D. Williams presenting. An event co-sponsored by community, civic and and educational organizations including La Crosse Schools, Gunderson Health, and the La Crosse Education Foundation. September 8th— Jefferson City, Tennessee: Carson-Newman University. Great Idea Lecture: Justice. Amanda W. Harrist discusses her research on children and social exclusion + REJECT screening. November 3—La Crosse, Wisconsin. Free Professional 1-5PM Workshop for Educators, Counselors, and other Youth Workers. Presented by Gundersen Medical Foundation, Coulee Region Compassion Alliance/Together Against Bulling 2016, Gundersen Department of Pediatrics and Behavioral Health. Space is limited. RSVP to kmedward@gundersenhealth.org by October 25th. November 3—Arlington, Texas. University of Texas. Department of Psychology, Private viewing. November 18— York, Maine. York Public Library Community Room. 6:30-8:00PM REJECT screening, discussion 8:00-9:00PM. Free and Open to the Public. Host: Connecting the Pieces—Together We Can! Panel guests include: pediatric neurologist Dr. Margaret Bauman, neuro-psychologist Dr. Laura Slap-Shelton, child and adolescent psychiatrist Dr. Joshua Gear, developmental pediatrician Dr. Carol Hubbard, social worker and founder of International Bullying Prevention Association Stan Davis and school resource officers, Jamie Rooney and Nick Piskopanis. January 26, 2015 — Columbia Grammar & Preparatory School, New York City. February 2, 2015 — Sewickley Academy, Pittsburgh, Pennsylvania. With Director and ostracism expert Dr. Kipling Williams. February 17, 2015 — Mary McDowell Friends School, Brooklyn, New York. Private screening, professional development. March 4, 2015 — DeKalb County, Indiana. DeKalb Central Schools. DeKalb High School. Special guest, Dr. Kipling Williams, Purdue University. August 18, 2015 Bartholomew County, Indiana Reject screens as part of “All In: Building A Positive Community” sponsored by Purdue University Extension. Southside Elementary School Auditorium, 1320 W. 200 S., Columbus, IN. Doors Open at 6pm. August 27, 2015 Dearborn County, Indiana Reject screens as part of “All In: Building A Positive Community” sponsored by Purdue University Extension. East Central High School Performing Arts Center, St. Leon Indiana. Registration begins at 6:00 pm. September 18, 2015 Birmingham Michigan The Roeper School, 1051 Oakland Avenue. Community screening, all are welcome. Film begins at 6:30pm sharp with post screening panel discussion featuring Reject Producer Peter Brauer, and NoBLE Anti-bullying expert Marlene Seltzer. September 22, 2015 Putnam County, Indiana Reject screens as part of “All In: Building A Positive Community” sponsored by Purdue University Extension. September 30, 2015 Attica Indiana at The Devon Theater. Two showings: 4-6pm and 7-9pm Community screening, all are welcome! Q& A Session featuring Attica Elementary teachers Patricia Hargan and Megan Reynolds. October 1, 2015 Attica High School, Attica Indiana. Screening for 7th-12th grade students. October 26-29 Columbia, Missouri Six community screenings and presentations in partnership with University of Missouri Extension and Central Missouri Community Action. Director Ruth Thomas-Suh and ostracism expert Kipling Williams in attendance. Jan 26— Cinebarre Theater, Community Screening @ 4pm Mt. Pleasant, South Carolina. Jan 27 — The Citadel, The Military College of South Carolina. Charleston, South Carolina. April 3 — Beaumont Hospital NoBLE Center being held at Oakland University, Rochester, Michigan — 5:30-8:00pm. Registration is required via Beaumont Hospital. June 12 — Charleston County School District (South Carolina) Educator Symposium. Introduction with Professor Steve Nida, The Citadel. June 24-27 — International Society for Interpersonal Acceptance and Rejection, 5th International Congress. Chisinau, Moldova at the Free International University of Moldova. July 23 — Professional Development Day. Irvington Community Schools. Indianapolis, IN. For Faculty and Staff Only. September 3 — Congregation Beth Elohim Early Childhood Center. Brooklyn, New York. September 26 & 27 — Auburn Public Theater, Auburn New York. October 1— West Side Montessori School, New York City. 6pm-8pm. Open to the Public. December 3 — 2014 Indiana Youth Institute Conference “Because KIDS COUNT“. Indianapolis Convention Center Indianapolis, Indiana. Dr. Kipling Williams, Purdue University, will lead post-screening discussion. NOTE: For registered conference attendees only. “Reject” producers Kurt Engfehr and Ruth Thomas Suh.